I love Whole Foods! And I love 365 (their store brand) stuff even more because it makes organic so much more affordable! 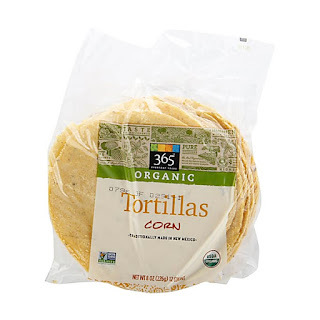 Some of the things that are hard to come by at the supermarkets are organic tortillas, pitas, pizza dough and other related round flat breads. Most organic bread brands concentrate on loaves and bagels. So I was pleasantly surprised when I saw this for sale at Whole Foods a while ago. The taste is great, and I love that it has no sugar (I wouldn't have even bought it if it did). But the tortillas are too crumbly. I don't know if it's because I kept them in the freezer or that's just how it is. I stored them in the freezer after buying and thawed them in the refrigerator when I actually wanted to eat them. I then just microwaved them with each meal. Maybe there was a "proper" way to heat them up? For now I'm not sure if I will buy these again. I might if I know I will eat them immediately. But I will most likely just buy the whole grain version instead.